Amelia Meman, Peer Leader: Amelia offers support to fellow AmeriCorps members and helps strengthen the Volunteer Maryland initiative through marketing and outreach. Amelia is a recent graduate from the University of Maryland, Baltimore County (UMBC), where she earned her BA in Gender Studies. 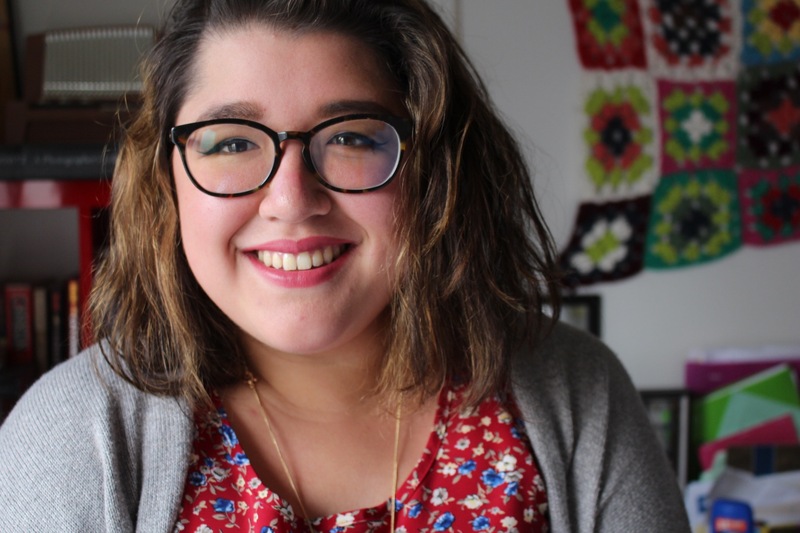 For the last two years, she has worked with the Women’s Center at UMBC to strengthen the department’s overall mission to promote the advancement of women and other minorities on UMBC’s campus. Amelia currently lives in Baltimore and is interested in social justice, pop culture, and her cat, Yoshimi. Chelsea Goldsmith, Peer Leader: Chelsea works to support the Volunteer Maryland Coordinators by connecting them with people and resources which help them meet their missions. She served as a Volunteer Maryland Coordinator in VM Class 27 at the Baltimore Urban Debate League, where she recruited community members to enhance the educations of Baltimore City Public School students. Chelsea is an active volunteer in her corner of SE Baltimore and at museums & cultural events across the city. She holds a BA in English and American Studies from Wesleyan University. Kerry Ose, Outreach Manager: Kerry is responsible for program marketing, outreach, and partnership development including recruitment and selecting Volunteer Maryland Sites and Coordinators. Kerry served as a Volunteer Maryland Peer leader in VM Class 25 and as a Coordinator in VM Class 24 at Baltimore Neighborhoods, Inc. Kerry holds a PhD in English from the University of Illinois at Urbana-Champaign. She has worked as a writer and college instructor, and she currently lives in Columbia. Nicki Fiocco, Program Manager: Nicki is responsible for monitoring, training and evaluating Volunteer Maryland Coordinators and Service Sites. Nicki served as a Volunteer Maryland Coordinator in VM Class 24 at Quiet Waters Park in Annapolis, this was the beginning of a serious focus on community engagement and volunteer management. Nicki holds a BA in Geography and Environmental Science from University Maryland Baltimore County. Patrice Beverly, Director: Patrice takes a lead role in staff supervision, fund raising and financial management, evaluation, and training. Patrice served as a Regional Coordinator in 2002 and as a Volunteer Maryland Coordinator in 2001. Her VMC year was spent in beautiful Annapolis at the Anne Arundel County Board of Education working with teachers and students to strengthen service-learning. Patrice holds a Bachelor of Science degree in Speech Pathology from Towson University. Elena Felton, Peer Leader: Elena is responsible for supporting the Volunteer Maryland Coordinators with resources, training, and guidance. Elena served as a Volunteer Maryland Coordinator in VM Class 24 at CASA of Baltimore County Inc. Elena also served as the recent Peer Leader for VM Class 26. Before her work with VM, Elena volunteered with many diverse groups and spent 2 years employed with Venago Training and Development Center located in Clarion Pennsylvania, which services individuals with mental and physical disabilities as a Direct Life Coach. Elena attended Clarion University of Pennsylvania where she received her Bachelor of Science degree in Liberal Studies, with two concentration minors in Sociology and Social Work. Elena currently lives in the Baltimore area and is preparing to obtain her Master of Social Work degree. 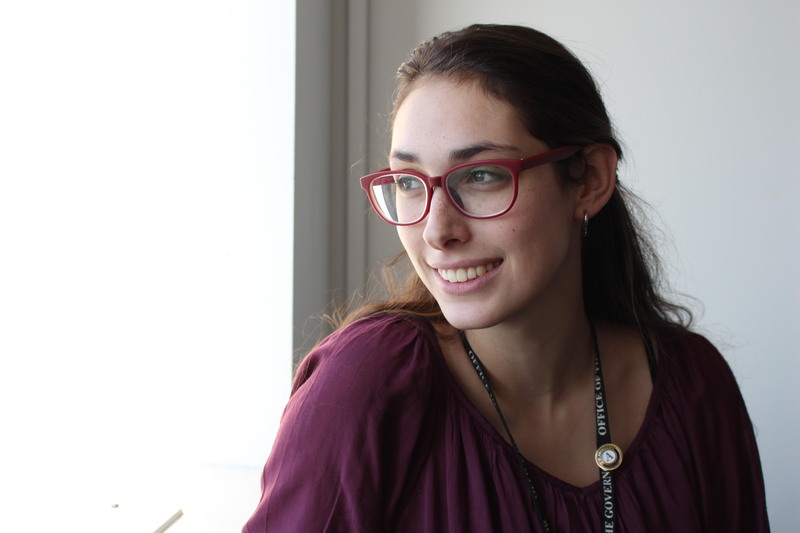 Elena is very passionate about service and community involvement. Elena is creative, energetic, and enjoys new adventures. Laura Aceituno, Program Manager: Laura is responsible for monitoring, training and evaluating Volunteer Maryland Coordinators and Service Sites. Community development and volunteerism has been a lifelong passion for Laura. She served as a Volunteer Maryland Coordinator in VM Class 21 at the Montgomery County Volunteer Center and a Regional Coordinator in VM Class 22. Before her VM service years, she attended Hood College where she received her Bachelor of Arts degree in Psychology in 2008. Taeketra Haynes, Peer Leader: Taeketra is responsible for supporting the Volunteer Maryland Coordinators with resources, training, and guidance. Before joining the Volunteer Maryland Support Team, Taeketra attended the University of Miami and received her Bachelor of Arts in History and International Studies. During her time there she participated in several student organizations and developed a love for civic engagement. After graduation she joined the Public Allies AmeriCorps Program, and was placed at CHAI as their Community Conversations Outreach Coordinator. She loves listening to music, playing sports, hanging out with her friends, learning new languages and trying new things. She is willing to try (almost) anything at least once. Kelly MacBride-Gill, Peer Leader: Kelly is responsible for supporting the Volunteer Maryland Coordinators with resources, training, and guidance. 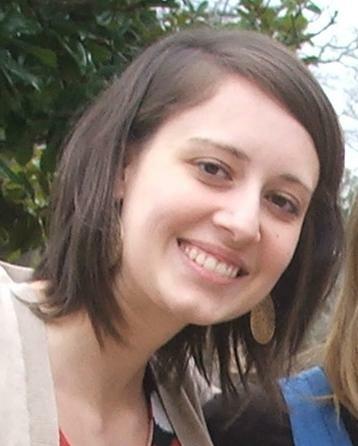 Kelly previously served as an AmeriCorps VISTA with Habitat for Humanity of Montgomery County from 2010 to 2011. A recent transplant to Baltimore, Kelly spends her free time gardening, cooking, and dog-watching. Kelly holds a Bachelor of Arts in Anthropology from the University of Maryland, where she is also a proud alum of Alpha Phi Omega. 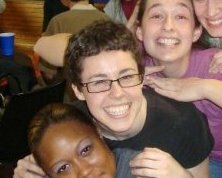 Kerry Ose, Peer Leader: Kerry is responsible for supporting the Volunteer Maryland Coordinators with resources, training, and guidance. Kerry served as a Volunteer Maryland Coordinator in VM Class 24 at Baltimore Neighborhoods, Inc. She has worked as a writer and college teacher, and, in, recent years, has been involved in grassroots efforts to support and improve public education. Kerry holds a PhD in English, watches a lot of Netflix, and is an avid swim parent. Barb Cooke, Peer Leader: Barb supports first-year coordinators and Volunteer Maryland staff, facilitating regional meetings and resource sharing to develop strong volunteer and service-learning programs. She is passionate about service and collaboration. Barb served as Volunteer Maryland Coordinator in VM Class 23 at Partners in Care, a time exchange community non-profit supporting older adults aging in place. Barb home schooled for 15 years prior to serving with Volunteer Maryland. She holds a Masters of Arts in Human Development and is masterful at coordinating resources. Joy Johnson, Peer Leader: Joyell served as a Volunteer Maryland Coordinator in VM Class 23 at the Banneker-Douglass Museum in Annapolis. Before joining VM, she was a student at Washington College, where she received her Bachelor of Arts degree in Humanities with a minor in Black Studies. In her spare time, Joyell volunteers in and around Maryland to raise domestic violence awareness, empower youth, and preserve Black history and culture. Maureen K. Eccleston, Director: Still here and still blogging! Only now, instead of working toward a Master’s degree, Maureen actually has one. Corrine Handy Regional Coordinator: Corrine is responsible for providing thorough and informative support to VMCs in the form of resources, correspondence, and development opportunities. As a former Volunteer Maryland Coordinator in VM Class 22, Corrine worked to build the capacity of youth development program The Power Project by recruiting volunteers and managing the volunteer program at the St. Francis Neighborhood Center. Holding a Bachelor’s of Arts in Political Science and French and a Master’s of Arts in Intercultural Communication, Corrine is looking to start a non-profit organization that focuses on preparing and training volunteers to do service abroad. In addition, she hopes to one day own a restaurant offering food that reflects the culture of the African Diaspora. Megan Stransky, Regional Coordinator: Megan is responsible for supporting a group of Volunteer Maryland Coordinators focusing on the issue areas of education, human needs, public safety, homeland security, and the environment. Megan was a Volunteer Maryland Coordinator in VM Class 22 at the Cylburn Arboretum Association, where she worked to develop a youth component and strengthen the existing volunteer program. In 2009, Megan graduated with a Bachelor of Science Degree in Physics and Astronomy from the University of Maryland, College Park, where she was a trip participant and two-time trip leader with the Alternative Breaks Program, which fueled her passion for community service and volunteerism. Maureen K. Eccleston, Director: Maureen takes a lead role in staff supervision, fund raising and financial management, evaluation, and training. Maureen joined VM in January 2008 as the Project and Resource Manager, responsible for overseeing the VISTA program. Maureen’s history with national and community service began as a member of AmeriCorps*National Civilian Community Corps (NCCC) in 1999. Since then, she served as an AmeriCorps*VISTA member, a Training and Technical Assistance Coordinator with the Florida Alliance for Student Service, a Service-Learning Coordinator with NCCC, and a Program Manager for the national office of Experience Corps. Currently working toward a Master of Arts in Nonprofit Management, Maureen lives in Baltimore with her husband and family of plants. Kimberly is responsible for c urriculum research and development for Volunteer Maryland’s VISTA program, along with creating videos showcasing the work of Volunteer Maryland’s amazing AmeriCorps members and the nonprofits we partner with. Kimberly served as a Volunteer Maryland Coordinator in VM Class 21, at the Citizenship Law-Related Education Program for the Schools of Maryland. While there, she coordinated and recruited volunteers for their Baltimore City Teen Court program, a diversion program for Baltimore City youth that holds youth accountable for committing crimes through a positive peer influence model, while teaching them to engage with and take an active role in the law. A transplant from Connecticut, Kimberly is enjoying Baltimore more and more each day, and looks forward to sticking around to attend nursing school here in the fall. 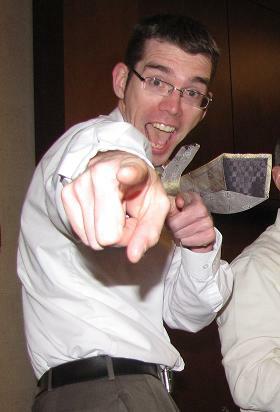 Michael Nealis, who blogs on Tuesdays, is a Regional Coordinator for Volunteer Maryland. This means that he’s a lot like Vanilla Ice. When he’s not busy solving problems, collaborating, and listening, he’s planning his next big move. He’s busy supporting Volunteer Maryland’s Volunteer Maryland Coordinators, volunteering with Habitat for Humanity of the Chesapeake, and conducting social media trainings in and around Baltimore. Katelyn Ryan is a Massachusetts native and currently resides in Owings Mills, MD. 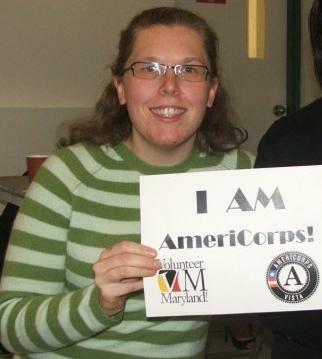 She is serving her second year of AmeriCorps with Volunteer Maryland as a Regional Coordinator. Her first year in AmeriCorps was spent serving as an AmeriCorps NCCC member with the Southwest Region Campus in Denver, Colorado. While serving in AmeriCorps NCCC her service projects ranged from working with FEMA on disaster in Galveston, TX, refurbishing damaged homes with Rebuilding Together New Orleans, teaching Denver Public Schools students about gardening and healthy eating with Learning Landscapesand trailblazing in a Texas State Park. Some of her interests include running, finding ways to be “green”, shopping at Whole Foods, and listening to country music. Laura is part of a team of Regional Coordinators who assist both volunteer coordinators and Volunteer Maryland staff with meeting program objectives. Community development and volunteerism has been a lifelong passion for Laura. She served as a Volunteer Maryland Coordinator in VM Class 21 at the Montgomery County Volunteer Center. In this role she supported three diverse volunteer programs. These volunteers served as interpreters and translators, helped during county emergencies, and advised community members looking for volunteer opportunities. Originally from Burtonsville, Maryland, Laura has recently moved to Baltimore. 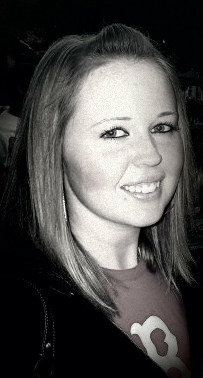 Lauren Mulcahy, who blogs on Fridays, is the VISTA Leader with Volunteer Maryland. After spending one year as a Volunteer Maryland VISTA member at a family mentoring organization in Baltimore, she jumped at the chance to be involved with supporting other members across the state. She is fortunate enough to be hosted at Camp Fire USA, where her ability to support service-learning nicely compliments the indirect service she does with Volunteer Maryland. Lauren’s two passions in life are food and community service, and post-AmeriCorps she plans to combine them via studies in dietetics with an emphasis on its application within public health.